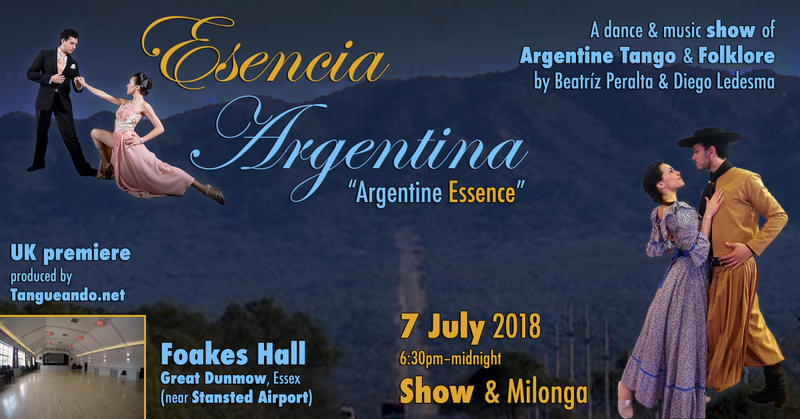 Tangueando.net proudly presents for the first time in the UK “Esencia Argentina”, a music and dance show by Beatriz Peralta & Diego Javier Ledesma on Saturday 7th July. Esencia Argentina will bring you on a journey through the identity, the music and dance traditions, the urban culture of Buenos Aires along with the magic and mysteries of Santiago del Estero. 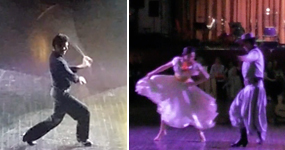 In this UK premiere, Beatríz Peralta and Diego Ledesma will delight us with their performance of music and dancing, evocative of everything Argentinian. Following the show, there will be a Milonga (Argentine Tango social dancing session) until midnight. Food & drinks will be available for purchase at the venue. Please note: Milonga Pasional and its team has moved for this Saturday only to this great venue. Please visit the Facebook event to confirm your attendance and share with your friends. An emotional, eye-catching show where elegance, sweetness, charm, gracefulness and high energy are expressed in the passionate Tangos, the magic of Argentine Zamba and uplifting Chacarera, the Fantasía de Bombo, the breath-taking Boleadoras, and more by Argentine professional dancers and performers Diego Ledesma & Beatríz Peralta. Diego was born and raised in Santiago del Estero between Malambos de Bombo and Chacareras, in a traditional family, faithful to their Music and Dance customs. Santiago del Estero also called "Mother of cities" for being the oldest city in Argentina and "The crib of folklore" because it is where the chacarera was born. They took part at the Festival "The March of the Strings and the March of the Bombos" in Santiago del Estero and the National Festival "Cosquin" in Córdoba. In 2017 they toured Bolivia with their show "Esencia Argentina", which was very well received by the public. 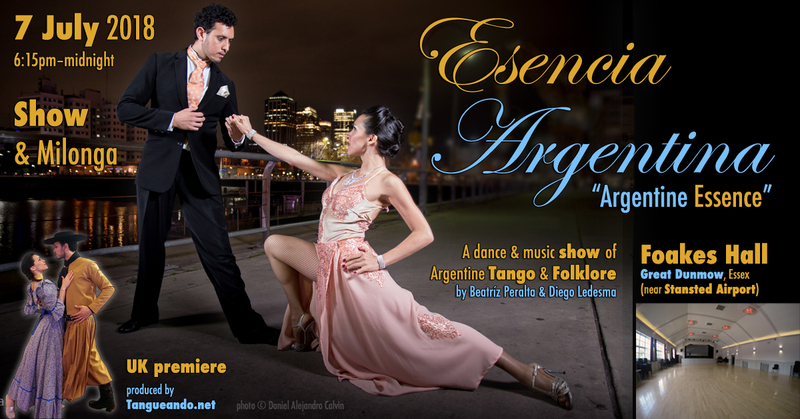 In 2018 they came on their first European Tour, participated in the very special Argentine Tango & Folklore London Music Festival and now premiere "Esencia Argentina" in the UK. Following their unforgettable performances at the opening of the 2018 Argentine Tango & Folklore London Music Festival, and the triple concert with Los Milonguitas & La Juan D'arienzo, they are back for another production by Tangueando. Tangueando School of Argentine Tango organizes this concert in Great Dunmow at the Foakes Hall. There will be a fully-licensed bar serving wine, local and international ales. Food & drinks will be available before and after "Esencia Argentina", but not during the show. There will be buffet food available to purchase at the venue. At Junction 8 of the M11 join the A120(E) towards Stansted and Colchester. Follow the A120 for about 5-6 miles heading towards Colchester and exit at B1256 following signs for Gt. Dunmow. At the Tesco roundabout, go straight over and turn left at the next roundabout (signposted left to Town centre). You will see the Foakes Memorial Hall at your left, entering Great Dunmow. There are plenty of parking spaces at the hall car park. By arriving earlier you improve your chances of finding parking at the venue. There are also two car parks nearby, which are free after 5pm: Chequers Lane Car Park and White Street Car Park are the ones closest to the venue. During "Esencia Argentina" there will be tables and chairs in the hall, some of which will be removed for the milonga later in the evening. Seats and tables will be available on a first-come-first-served basis. By buying your tickets online before the day of the show you save £2 off the price at the door. Electronic tickets save time and paper, do not need to be printed and can be presented on a mobile phone. At the door, you will be given a coloured wristband corresponding to your ticket type.